Originally from Oklahoma, Senior Pastors Brent and Melissa Hurt came to Brighton in 2008. They were voted in as the Senior Pastors February of 2017. Pastor Brent is an ordained minister with the Assemblies of God and holds a Business Administration Degree from Evangel University. Melissa holds a degree of Bachelor of Science in Elementary Education and currently teaches second grade at Willard Public schools. They have three children. Native to the Ozarks, Assistant & Children’s Pastors Mark and Sandie Cross came to Brighton Assembly in 2005. Pastor Mark is a licensed minister with the Assemblies of God and an avid outdoorsman. Sandie is the Executive Administrative Assistant to the Executive Director of AG World Missions. They have three grown children and two grandchildren. Originally from Florida, Youth Pastors Derek and Lindsey Washington began attending Brighton in 2007 and came on staff in 2015. Pastor Derek holds a Communication Arts and Media degree from Evangel University. Lindsey keeps busy taking care of their four busy boys. 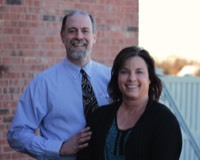 Native to the Ozarks, Teaching Pastors Steve & Marlisa Schroeder came to Brighton in 2001. Pastor Steve is a graduate from Central Bible College and an avid outdoorsman. Marlisa is a Software Development Manager with an insurance company. They have two daughters.